Walden Lake resident Frank Starmer has lived a life under the motto: Never stop learning. Now he has been honored with the Duke Medical Alumni Association's Distinguished Faculty Award. For Frank Starmer life is about following one's curiosity. A life without learning is simply a life not worth living. Frank Starmer with his drip kit. He is experimenting with colliding water drops for his new photo series. meditation. After years of innovative creations, he has been honored with the Duke Medical Alumni Association's Distinguished Faculty Award. His career with Duke has spanned more than half a century as an electrical engineer and computer specialist. Through his career he has worn many hats and has been a part of reshaping Duke’s medical advancements for years to come. He partnered with the Duke Cardiac Catheterization Lab to develop technology and approaches that would change the national conversation on ventricular fibrillation, created a system to capture data from patients undergoing coronary angiography, which led to the Duke Databank for Cardiovascular Disease, he helped start Duke’s Computer Science Department and developed the IT infrastructure for the nascent Duke-National University of Singapore Medical School. He has been a professor and an associate dean for learning technologies. He collaborated with colleagues across the globe to create a network of accessible learning to further benefit students at Duke and has acted as a mentor for generations of students. “When I go, all that’s left behind me are the students that I’ve touched,” Starmer said. As he entered retirement he and his wife settled down in Walden Lake. He quickly learned the days drag on endlessly unless one can bring back a structured routine to give each day a purpose. Courtesy of Frank Starmer. This picture won the “animal” category at the 2018 Florida Strawberry Festival. every aspect of his curious nature. Around 7 a.m. and 7 p.m. each day, Starmer finds himself off on an adventure. Sometimes he wanders the local nature preserves. On other days, he is paddling down hidden creeks in his kayak. Regardless of the setting he always is on the hunt for the same thing: a pattern of behavior that captivates him. In Singapore he joined a photography group, where he became fascinated with the behavior of local spiders. Lugging along his personal camera, he would spend hours watching them in their natural habitat and tried his hand at photography. That passion continued to blossom and soon he had thousands of photos capturing the behavior of spiders when they mated, wove webs and captured prey. 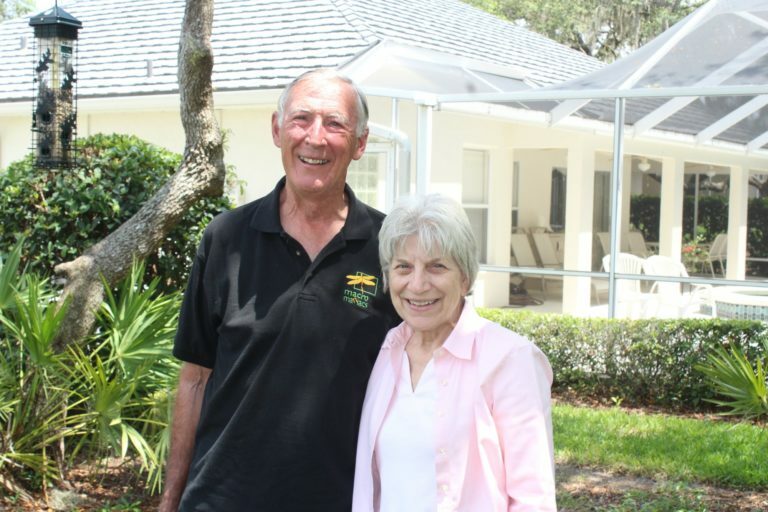 When he retired in 2015, he and his wife chose to move to Plant City both because she had family in the area and due to the abundance of nature preserves in the county. Courtesy of Frank Starmer. Frank will spend hours each day observing the behavior of animals and photographing them in the wild. His fixation on nature extends to non-arthropods as well. Last year he found himself following great blue herons as they nested and reproduced. Then he was searching for the perfect shot of white egrets and their fishing patterns. He patiently observed them for hours every day and soon learned how they train their chicks to fly, how they choose mates and how they compete for food. The watching and learning are just as exciting as viewing his final products on his camera. His work is nothing less than extraordinary. He uploads photos and videos online and has gained a dedicated following of nature and photography enthusiasts. His work has been featured everywhere, from mainstream outlets like The Discovery Channel to being selected as prize-winning art at the Florida Strawberry Festival. He is constantly inventing and has created Bluetooth technology that allows a smartphone app to create a real-time feedback loop between patients and their care providers, which could potentially cut down on unnecessary check-ups. Courtesy of Frank Starmer. Using a timed camera and a drip kit Starmer was able to photograph what happens when two water droplets collide. intricate photos. His camera is timed perfectly to a drip kit, which he can adjust to release different drops of water at different times so they collide right when his camera is activated. He jokes that having to figure out all of the math to make these “experiments” work perfectly keeps his brain busy and his days full.